This afternoon I had a work meeting with the folks at Trampoline Design. We were going over some new marketing ideas for us here at ShoreHaven. While there, I realized I never posted the work tables that Jason made for them earlier this year, when Trampoline moved into their new office space in the Empire Theatre Plaza on South Street. 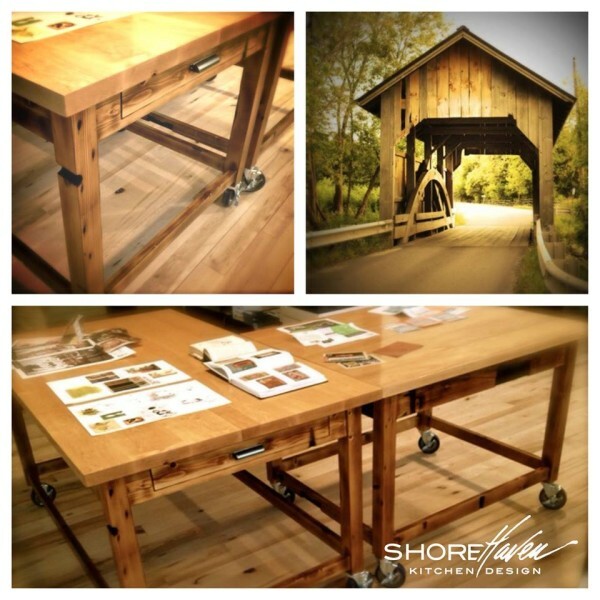 The tables were made of reclaimed spruce from the covered bridge in Manchester, Vermont, which was washed out during Hurricane Irene in 2011. The worn wood, the hand applied finish, the industrial caster wheels, and thick plank top, lend to the tables equal parts rustic charm and utilitarian functionality. The history behind the wood, give them a story that we’re not soon to forget. Revisiting Trampoline’s office today it was nice to think of this project. Although, full disclosure, we weren’t gathered around these tables, instead, we sat on the couch. Incredible story, top notch craftsmanship, great friends, and awesome team at ShoreHaven!